Picturesque Winona Lake, Ind., is home to a number of Grace Brethren organizations. Here’s a story from today’s Kalamazoo, Mich., Gazette, that touts some it it’s attractions. A portion of the story appears below. Click here to read the complete story. 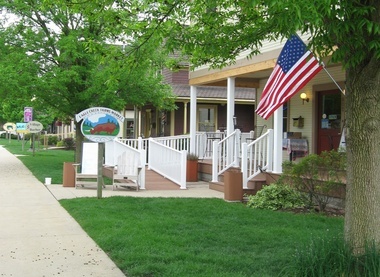 Tree-lined Park Avenue in Winona Lake, Ind., is home to a variety of shops and boutiques. WINONA LAKE, Ind. —Winona Lake is a winner. That’s what I wrote years ago on our first visit to this lakeside village. It won our hearts and we vowed to return. But we never did until recently. What drew us back was not only memories of our wonderful time there, but also my niece, Katie Reinke’s graduation from Grace College in Winona Lake. On our previous visit, Best-Ever Friend Dave and I did everything. We toured the Billy Sunday Home Museum and Visitors Center, 1111 Sunday Lane, and learned about this fiery preacher who, in the early 1900s, held weekly revivals for tens of thousands and who eventually settled in Winona Lake. We also visited the Reneker Museum of Winona History in Westminster Hall on Grace College’s campus, featuring local history including the life of Homer Rodeheaver, Billy Sunday’s music director, and founder of The Rodeheaver Company, a music publishing company.